When building his/her team, a leader should know the how and when of choosing from the three distinctive strategies mentioned in the subject. Mothers in my opinion are instinctive leaders. I feel pretty confident that this statement can be assumed to have global validity. So we will use simple examples from the context of child development to understand the strategies. Let us assume that a mother is teaching her kid writing skills. If she holds up the hand of the kid and guides the kid write the alphabet, she is mentoring. Mentoring is the process of skill flow from a skillful person to one who is learning. On the other hand, if she is marking corrections on finished work that was independently completed by the child and asking the child to come back with a revision, then she is counseling. Counseling is the process of highlighting gaps and providing advice for action. In the case of coaching, we have to upgrade the example a little.This is because coaching generally applies to high performance environments. So let us say that the kid is trying a sketch. The mother is engaging in an active dialog with the kid and helping her isolate the hurdles she is facing while completing the sketch. The mother also encourages the kid to come up with ways of overcoming those hurdles by self recall of the kid's own existing knowledge and skills. 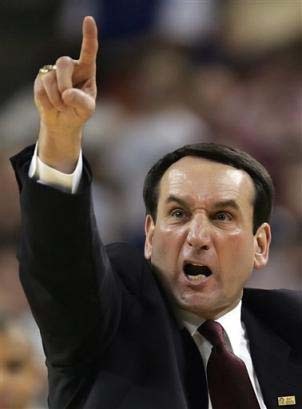 This is roughly the process of coaching. Each of these strategies have their own time and context to be effective. If either is irrelevant, the strategy will fail. In adults with high competence, ego and overconfidence tend to become learning disabilities as success tends to blind. Hence coaching is a careful process of helping isolate and eliminate blindspots. It takes its due course of time. There is nothing like fly-by-night coaching. I tried to come up with a simple model (above) to explain when each strategy becomes relevant. 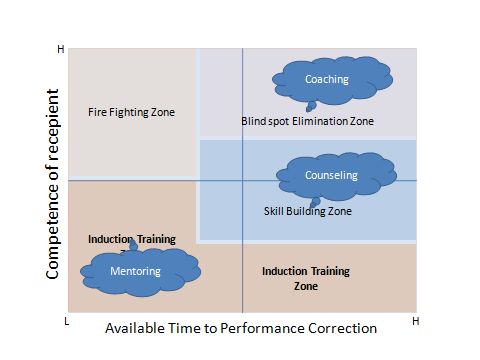 In induction training zone, the trainee is not hands on and hence the question of performance does not arise. In the fire-fighting zone, if the recepient is open to feedback, counseling might work to some extent. Any feedback/critique on the model is deeply appreciated.